Ludwig asked me to write this because he told me that he was was unqualified because of his dieting reasons. (Suuure. You haven't bowed down to the awesomeness that is THE WAFFLE.) The other reason was that there's this Splatoon 2 Splatfest thingy. I dunno what that is aside from the battle of the breakfast thing between pancakes and waffles. I was told I would have waffles and waffles I shall get. 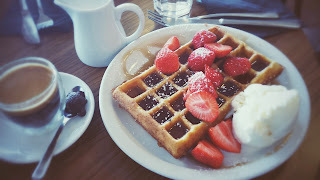 The waffle is the most divine, absolute breakfast food you can ever get your hands on. I'm here to convince you to join the cult. 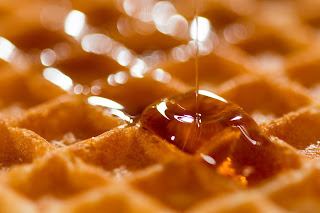 By mere observation you can see how a waffle has deep luxurious pools for the build up of a mouthful of decadent maple syrup running down its edges. Now top that with soft butter melting on top. Mmm! Perfection! But waffles aren't only for just sweet deliciousness! You can them done as a part of a savory meal. I have seen waffles with chicken, pierogies and even bacon on top. 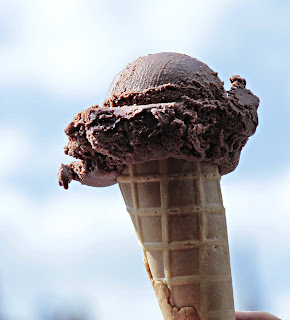 And last but not least, waffles are definitely the epitome for ICE CREAM. Stacey Abrams disagrees, and offers a pro-Pancake argument here. Sort of. Rawk chimes in, and he's also on Team Waffle. Rather than talk about the waffle as a food, he discusses waffle culture. Kamek disagrees with the waffle staffers, and offers a clear Pancake alternative. Which breakfast food does Ludwig ultimately end up going with? Read the final article on Pancakes vs. Waffles. I ordered a Pokeball Waffle Maker and it is supposed to come tomorrow as of this post as long as no one steals the package. Making waffles for team Waffles won't be as bad as having to set time for making the homemade salsa for Team Salsa. 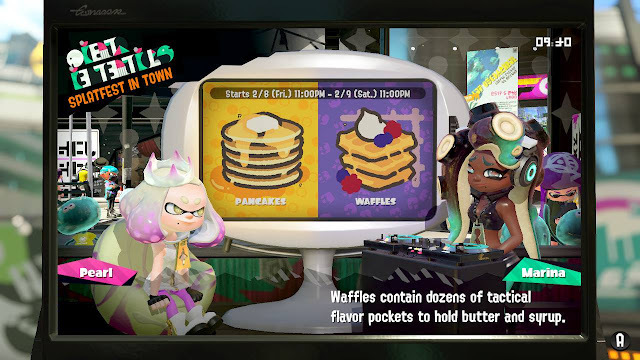 Ludwig probably gets asked this as much as a person who needs plastic straws gets asked about why they just don't use an alternative straw but is gluten free pancake/waffle mix an option so he can form an opinion for himself about this Splatfest? I'll answer the question 'cause it's about me. It's mediocre. Plus, they don't differentiate between the two. So using the mix for either the frying pan to make pancakes or for the waffle iron will result in them tasting the same for you? Well, the texture will turn out different, I guess, but the ingredients really aren't designed for that sort of thing. I have good memories of waffles. My dad used to homemake them and I'd slather them with syrup...now we hardly even eat together even though I'm still living with my parents. My most vivid pancakes memory, on the other hand, is thinking how darn SMALL IHOP's pancakes are for really quite too much money. So yeah, all the way agree with this one.